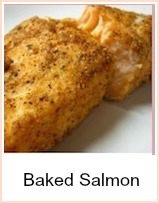 One of the easiest baked salmon recipes you could find. With a dill and avocado flavored mayonnaise, this dish would make an impressive dinner party main course or a healthy meal for the family. Preparation is minimal - you can prepare the mayonnaise in advance and the salad or veg and potatoes can be done whilst the salmon bakes. It is perfect as a family meal, a dinner party or summer evening al fresco meal. Hot buttered or crushed new potatoes and green veg or a salad would be perfect depending on the season. Heat the oven to gas Mark 6, 200C, 400F. 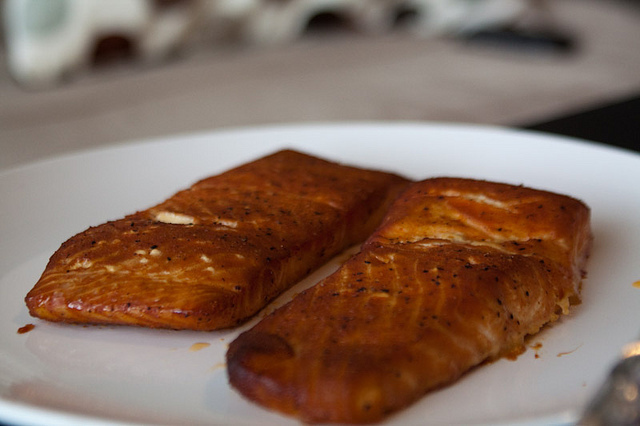 Rinse and dry the salmon steaks/cutlets. Take four squares of foil big enough to make parcels around the steaks and brush with oil or melted butter. Place a salmon steak in the center of each one. Put half a bayleaf on each steak. Divide the onion slices between them, pour a tablespoon of wine over each one, sprinkle half the dill between the salmon and finish off with a twist or two of black pepper. Seal the parcels and bake in the oven for around 20 to 25 minutes until the fish is cooked. Leave it to rest for about 10 minutes so that the flavor and juices are absorbed in the fish. 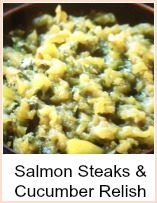 Whilst the fish is cooking, prepare the dill sauce for salmon. Remove the flesh from the avocados and mash to a pulp. Stir in the mayonnaise, juice and zest of the lemon and the rest of the dill. Add the chopped cucumber and then chill the sauce until the fish is ready. Unwrap the salmon and discard the onion and bay leaf. Serve on warm plates with buttered new potatoes and either green veg or a salad. Baked salmon recipes are really useful to have in your cooking reportoire - they're suitable for family meals (full of omega oils) or dinner parties. 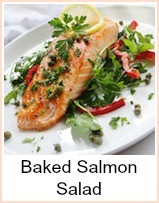 A very beautifully cooked baked salmon with a creamy dill sauce. Just right for a dinner party or an al fresco summer meal with friends - or treat the family - it's healthy and they're worth it!